Figure 3: Example of how differences between model-simulated and satellite-retrieved XCO2 (top) are used in inverse modelling to obtain improved estimates of the surface fluxes of CO2 over land (bottom). 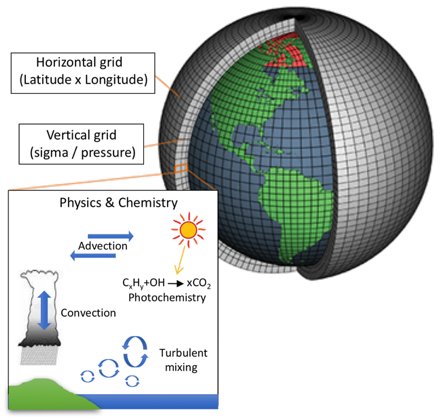 Atmospheric models are used at SRON1) to simulate the chemical composition of the atmosphere. They are so-called tracer transport models, used to compute the dispersion of trace gases in the atmosphere, accounting for atmospheric advection, turbulent diffusion, moist convection, etc. (see Figure 1). The aim is to simulate the atmospheric state as accurate as possible at times when measurements are available. The difference between the measured and simulated concentration is used to improve our process understanding, in particular, of the processes that introduce and remove tracers from the atmosphere. In such applications, it is important that the meteorology in the model keeps track of the actual meteorology at the times when the measurements were taken. This is achieved by prescribing meteorological fields from a state-of-the-art weather forecasting model. 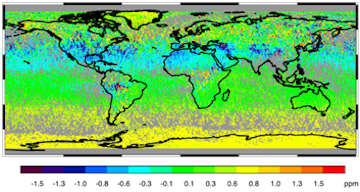 The global transport model TM5, which is most commonly used at SRON to investigate satellite data, is an off-line model. Such models do not solve the governing equations of fluid dynamics as in general circulation modeling (GCM), but calculate the tracer transport using the meteorological fields that are computed by a GCM. The advantage of off-line models is that they are highly computational efficient without losing accuracy. 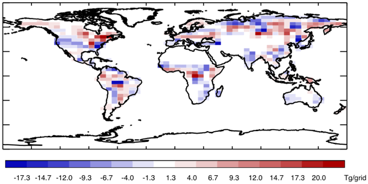 We use atmospheric models in combination with inverse modelling techniques to improve the quantification of the global sources and sinks of certain gases, using information about their atmospheric abundances contained in satellite measurements. 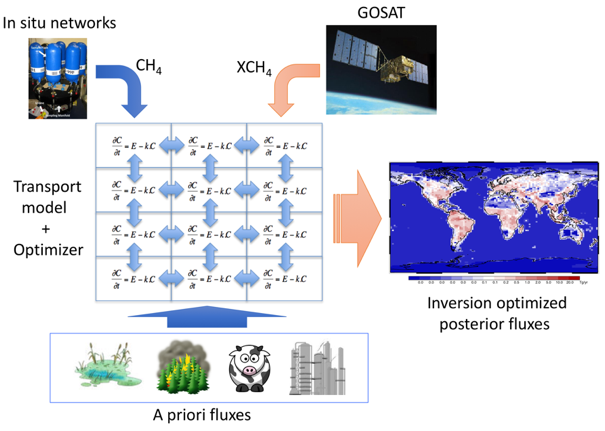 Here, inverse modelling is used to determine the configuration of sources and sinks that optimizes the agreement between the atmospheric transport model and the satellite measurements (see Figure 2 and 3). We use the TM5-4DVAR system, where 4DVAR refers to the mathematical procedure that is used to solve the inverse problem. The method is applied to the greenhouse gases CH4 and CO2, using totals column retrievals from a.o. the SCIAMACHY and GOSAT satellite instruments. Additional information about the source composition can be obtained using CO, which is released in incomplete combustion, notably biomass burning. Using a combined inversion of CO and CO2 allows us to investigate CO2 emissions due to biomass burning. With the improved spatial resolution of Sentinel-5P/TROPOMI and later Sentinel-5, the quantification of urban and industrial CO emissions comes within reach, supporting the monitoring and forecasting of air quality. To prepare for the improved spatial resolution and coverage of future satellite missions we contribute to the development of the meso-scale transport and chemistry model WRF-CHEM. The use of this model allows us to increase the spatial resolution of our analyses up to 1x1 km2 which allows a.o. the quantification of emissions from large cities and industrial facilities. To reduce the computational burden, the spatial domain is limited to the size of one or a few European countries. The global TM5 model is used to derive the boundary conditions at the lateral and upper edges of the WRF-CHEM domain. 1) Atmospheric modelling at SRON is a close collaboration with groups at VU, UU-IMAU, and WUR.